Nas performin in Paris in 2014. Nasir bin Olu Dara Jones (born September 14, 1973), better kent as Nas, is an American rapper, sangwriter, entrepreneur, record producer an actor. 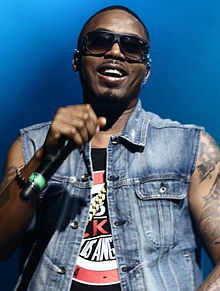 ↑ "Pregnant singer Kelis set to divorce rapper Nas". New York Daily News. May 1, 2009. Retrieved October 25, 2009.